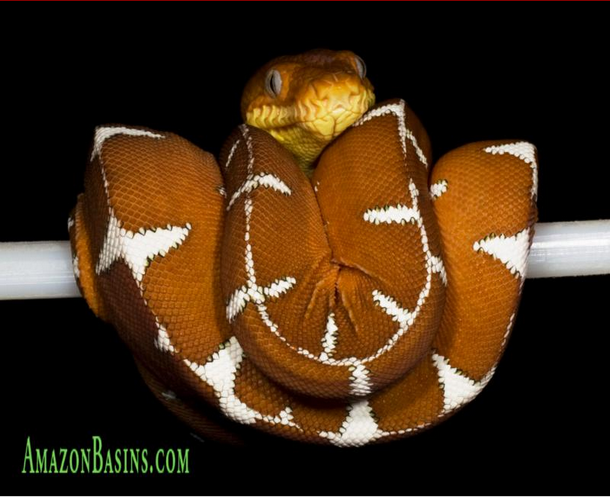 Corallus batesii is a species of arboreal boa. They have a yellow belly with a body color that is generally darker green with a dorsal stripe, often bordered by some black spots with enamel-white markings on the dorsum. Corallus batesii is a more desirable animal from a collectors’ standpoint due to their impressive size, striking coloration and gentle nature. Newborns or neonates can be kept in tubs with perches for the first 2 years. Juveniles and adults need a reasonable sized cage in the 0.7 x 0.6 x 0.6 meters (30 x 24 x 24 inches) range. Perches are critical and should vary in size from 20% to 60% the snake’s diameter mid-body. Perches too large in diameter can cause tail kinks over time. Ventilation is also key as are elevated water bowls. We try to maintain a perch size with a maximum diameter equal to 1/2 or less than that of the body of the Basin. Each enclosure incorporates two different perch diameters with cross perches of approximately half of the diameter of the main perch. With fake plants creating foliage on the perches the snake feels secure as it emulates their natural behavior. I don’t use any additional hide boxes. The use of “puppy pads” is an ideal substrate for Amazon Basins since they can be misted (either manually or automatically) and they will retain humidity and slowly release it throughout the day. Puppy pads are inexpensive and can be easily changed when soiled. We maintain a 12 hour on and 12 hour off light cycle throughout the year. Red lights are used at night for feeding and observation. Except for temperature cycling during mating, we maintain a daytime ambient of 28 °C (82 °F) and a nighttime of 25 °C (78 °F). In reality our animals can achieve a maximum temperature of 42 °C (108 °F) by basking on the upper perch under the heat panel and a low of 24 °C (75 °F) on the lower perch on the opposing side of the cage from the ceiling mounted heat panel. Hydration is critical for Amazon Basins for regular defecation and easy sheds. It is recommended that water bowls be mounted high next to the Basin’s perch to encourage drinking. Amazon Basins are very sensitive to clean water. Through the use of our automated misting system, we achieve a daytime high in the 70% to 80% humidity allowing the cage to dry out overnight to a low of 50% before an 8:00 AM lights on and 3 minute substrate misting cycle. We believe it is essential that the Basins do not experience extreme fluctuations in humidity, that is, that their environment is not allowed to repeatedly “dry out” and then become humid. This seems to be a recipe for creating respiratory problems. Depending on manual misting to maintain humidity for your Basins is a bad idea in view of the distractions everyday life presents. An alternative to an automated misting system for maintaining humidity is an under cage heat pad from Kane Manufacturing strategically placed under a water container inside the animal’s enclosure. Feed frozen/thawed mice or rats from a reliable source. Never feed live animals. Never re-freeze a thawed animal. Never feed more than one food item to a Basin during a feeding. Feed neonates every 7 to 10 days, juveniles every 10 to 14 days and adults every 14 to 20 days. Do not feed a Basin more than 3 meals between bowel movements. Most collectors believe that the less you handle your Basins, the better. These are not the type of snakes that can be passed around at a social gathering which may be appropriate for a Common boa or Ball python. Having said that, we often handle our animals when transferring them from their cages to the rain chamber for exercise and elimination. Frequently we will use our removable perch system in moving an animal and gently coaxing the Basin off the perch into the target cage or snake bag. It is essential that you do not force an animal off of a perch, especially a neonate. Rough handling can result in kinked or deformed tails as the animal matures. In general the Basin is a gentle creature with an inquisitive and calm personality, at least during the daylight hours. During the night when the lights go out, Basins become savage feeders and will strike at most anything that is warm or moves. The collector should take advantage of this natural inclination and handle the animals, when necessary, during the day and feed at night. When in shed Corallus batesii benefit from a slight increase in humidity. Perfect sheds mean that humidity levels are on spot. 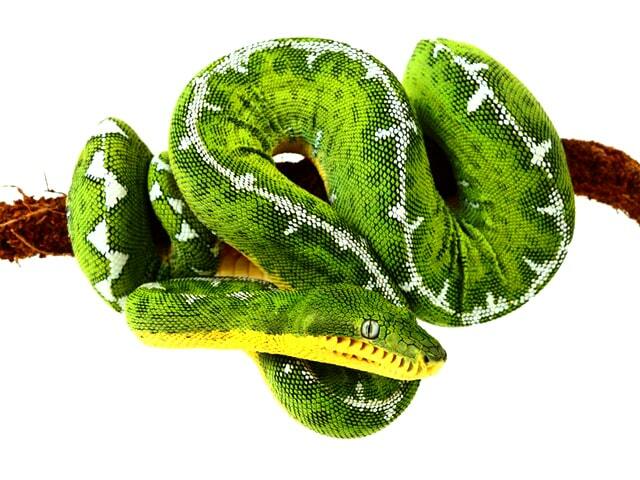 Amazon Basin Emerald Tree Boas are very hearty assuming they are kept singularly in stable control environments. The most frequent illness seen in captivity are respiratory infections which must be treated without delay with an injectable antibiotic such as Fortaz (Ceftazidime). Emerald Tree Boas are very clever as masking health issues so it is critical for the keeper to be aware of any signs of discomfort or distress in an effort for early detection. Hydration is the key to maintaining proper health in captive populations of Emerald Tree Boas. We provide fresh water on a weekly basis and will occasionally place our Basins in our Rain Chamber for a temperature controlled shower. Basins are observed to drink for 20 to 30 minutes while in the chamber. Sufficient hydration leads to regular bowel movements, clean sheds and, in gravid females, avoidance of retained (sticky) ovum during birth. The so called “regurgitation syndrome” which was frequently seen in imported Emerald Tree Boas and whose cause has never been fully determined can be avoided by purchasing captive born animals.